Ocean Campus’s Creative Arts Extension Building experienced power outages on the mornings of Aug. 23 and Aug. 28, resulting in 89 relocated and 12 canceled classes, according to relocation schedules created by Dean of Instruction Lillian Marrujo-Duck. Since the building’s transformer stopped working on June 27, the Buildings and Grounds department has consecutively installed three generators behind the building to supply it electricity. The management of the outages underscored how Buildings and Grounds must go above and beyond to service decrepit facilities when working with limited resources. Buildings and Grounds ordered a new transformer for over $100,000, but Kirk estimated it will take until the end of October to complete its installation. Meanwhile, renting consecutive generators has cost the college about $5,000 so far, Kirk said. “Our facilities team is doing their best; regrettably, they are significantly understaffed at this time,” Media Relations Director Connie Chan said. The facilities department in 2016 had identified $450 million in needs that were deferred due insufficient funding, according to a facilities committee capital plan update. Last spring, Facilities Vice Chancellor Dr. Reuben Smith told The Guardsman the facilities department had a backlog of more than 4,000 work order requests. Today, Buildings and Grounds has 10 engineers on staff as well as a chief engineer and senior engineer. From 6 a.m. to 10 p.m., the department services Ocean Campus and the college’s eight other centers, which encompass over a million square feet of architecture. The Creative Arts Extension Building’s original transformer stopped working on June 27 because of a failed coil. Buildings and Grounds found water inside the transformer room on the same day but have not yet identified the reason for the coil’s failure. Shortly after the transformer failed, the department installed a substandard generator due to the luck of the draw with the rental company, Kirk said. A few days later, the department installed a second generator that lasted until Aug. 23. Kirk said that a battery cable had vibrated loose off of its terminal due to prolonged use. Although rumors of attempted theft circulated the building, nothing indicated theft, Kirk said. The department replaced the battery cable and had the building running by 12:45 p.m., according to an email to faculty by Marrujo-Duck. 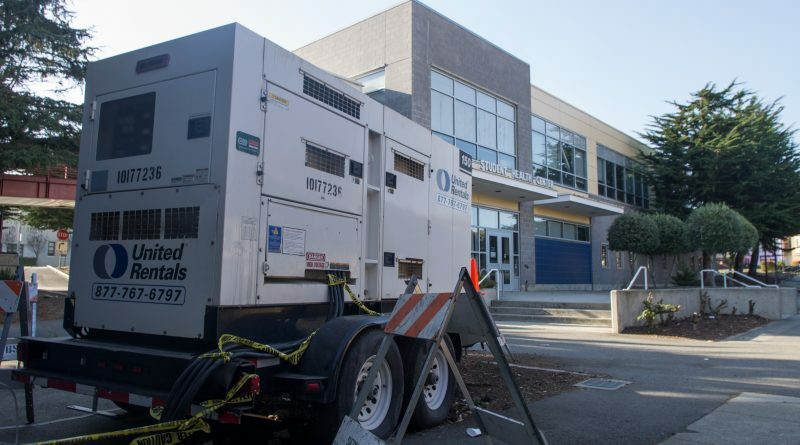 From the night of Aug. 27 to the following afternoon, the generator failed again because the truck of United Rentals — the company providing the generator fuel — broke down, Kirk said. A third generator was installed by 4:30 p.m. on Aug. 28, and Marrujo-Duck managed to relocate every class. 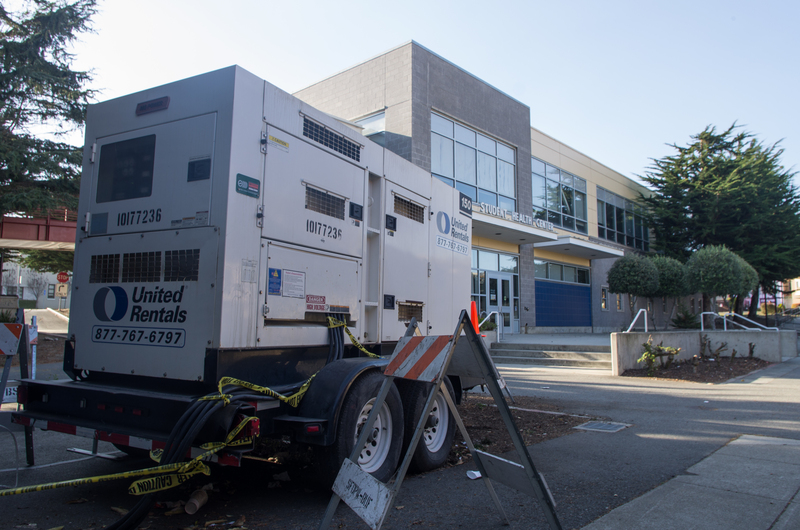 All three generators were installed behind the Creative Arts Extension Building without any fencing, drawing concerns from faculty within the building. “If you took a knife to it, you would electrify yourself and die immediately,” said Dana Jae Labrecque, a Broadcast Electronic Media Arts professor who has studied electrical currents. One side of the current generator is connected to the Creative Arts Extension Building by electrical cords, which are covered in yellow tape. The other side of the generator has a hook that attaches to vehicles. Kirk said putting a permanent fence around the generator is an option, and Buildings and Grounds has a fence installation company that will eventually be on campus. The company could examine the generator area to determine if installing a fence around it is feasible, but Kirk does not know when that would be. Moreover, Kirk said if someone was intent on damaging that generator, a fence wouldn’t stop them.